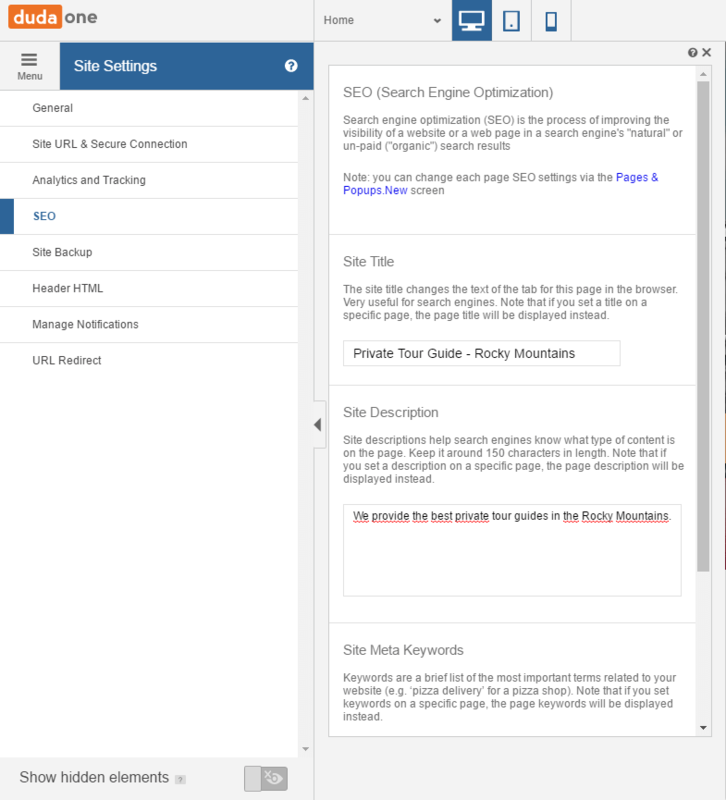 Duda Website Builder Review 2019 – A Good Idea for Your Website? Duda Website Builder Review – Responsive Site Creation Made Easy? Not only is there a feature that will help you create multilingual websites, there is also a unique website personalization tool (formerly called inSite). This enables you to send your visitors customized offers based, for example, on their browsing history or the city they live in. All of this comes at a price, however – compared to their competitors, Duda’s Website Builder is not exactly cheap. Nevertheless, you can try it out risk free – there’s a 30-day trial period, which is completely free and comes with no strings attached. Our overview will give you an idea of how the website builder did in general and whether it’s worth its price. You can use your own domain and create multilingual websites. To build online stores with more than 10 products. Create up to 8 websites with 10 team members. All prices are per month with the yearly payment option (except ‘Site for Life’ plan). Domain not included. In our view, Duda has the most powerful system to create a website in different languages. A pity blog articles and ecommerce products currently can’t be translated. Not only is there no real free plan, Duda’s paid plans are also starting at a much higher level than most of their competitor’s. Please note that you can get pretty much the same product (a white-label version) from 1&1 Ionos at a lower price. The menu is simple and intuitively structured. The editor mode offers an immediate preview, including well-thought out previews for desktop, tablet, and mobile screens. A large number of modern designs are included. Advanced users can take an empty template and start from scratch. All designs are optimized for smartphones and tablets, making them responsive. The editor offers previews for every type of device. No DudaMobile ads are shown in paid plans. Additional languages can be added through the language feature: this is one of Duda’s greatest strengths! It uses a folder system and is SEO-friendly (unlike a lot of competing products). It supports all major languages (including Asian characters). Available in all plans. Domain names and email hosting aren’t included. You can either register a domain through Duda or link an existing one to your Duda website as well. SSL encryption is available in all paid plans. Find more information in our FAQ. You can go up to three levels deep. This should be sufficient for most use cases, but it may be restrictive for some projects. There is no app store, but the editor offers a wide range of useful features. You can also use the Website Personalization Tool to add interactive elements: an information bar, pop-ups, special offers, etc. Yes, you can insert advertising (e.g. banners). This ecommerce solution is based on Ecwid’s online shop system. Every plan comes with 10 products. If you need more, you can upgrade to 100 or 2500 articles. Any and all relevant settings can be adjusted to match your needs. Google will like the fact that Duda SSL-encrypts your website, which can benefit your rankings. Duda also pride themselves with fast loading pages. Easy to use: Just a single click to add, and it automatically includes RSS. Unfortunately, comments are only available via Facebook. An analysis tool is included. However, you can use Google Analytics just as well. A wide variety of customization options. While individual pages can be protected by a password, you cannot create user accounts. Not included. You will have to use another provider – more information on that can be found here. You can always add HTML code. Beyond that, you can edit the template itself in the developer mode. Duda offers unlimited storage space. It is possible to backup and restore your Duda website. 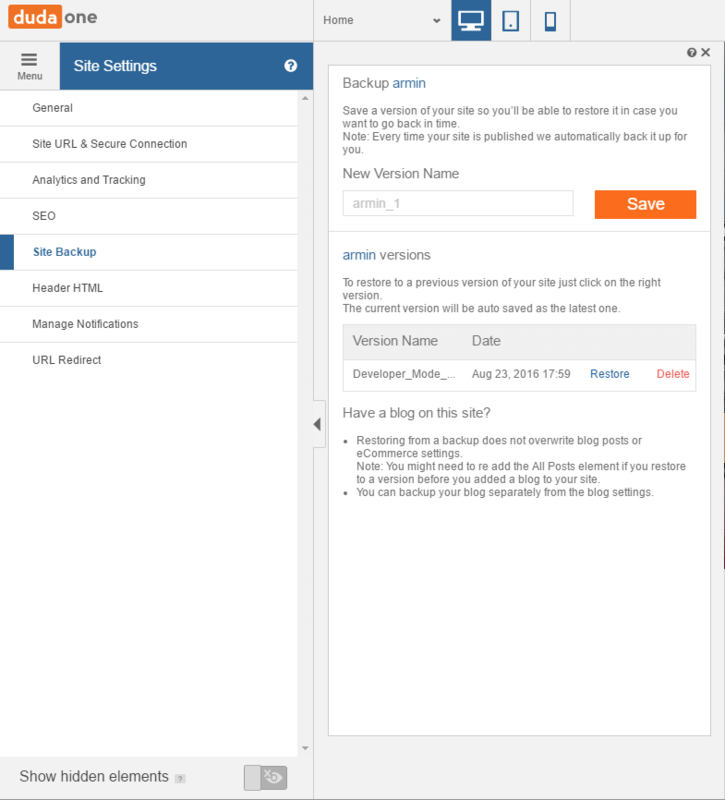 Every time your site is published, a backup gets created automatically. Depending on your plan, comprehensive FAQ, chat, email and telephone support are available. There are also a few videos you can check out. The editing process is flexible and fast. It doesn’t take long to figure out how everything works. Duda have put together a well-engineered website builder with a wide variety of features. Especially interesting for anyone with a multilingual project. Unfortunately their prices are too high in comparison to 1&1 Ionos MyWebsite. From our perspective, Duda is ideal for small and medium-sized website projects. The design templates are not only nice to look at, but anyone can customize them – even without programming skills. The only thing that we don’t like is that you cannot pick a different theme once you have made your initial choice. However, if you want more control than that, Duda has you covered: Just switch into “Developer Mode” and start experimenting! The layout and visual style remind us of Weebly a lot. And, similar to Wix, you can add animations to, perhaps, breathe a bit of life into your site. Duda’s Website Personalization Tool is especially interesting. It lets you customize your visitors’ user experience even further – you can show first-time visitors a welcome video, for example, or provide offers tailored specifically to visitors from certain cities. The possibilities are almost endless because you can create your own actions. We do have to deduct some points for the shop. When compared to Shopify or Weebly, the prices are just a bit too high. An app store would have been nice as well – Weebly and Wix both have one. This makes adding new features much easier. Where Duda truly shines is languages: it’s our top recommendation for multi-lingual websites. No other site builder makes it as easy (and SEO-friendly) to serve international visitors. Keep in mind that 1&1 Ionos MyWebsite is essentially the same product as Duda but already starts at $7 per month. They offer Duda as a white-label version and score a higher place in our ranking thanks to the more affordable prices. Click here for a free Duda Website Builder trial. Not sure what site builder is best for your project? Let our smart finder decide for you in 2 minutes. How do I cancel Duda? Duda offers a free trial you can check out with no strings attached. Should you be using a paid plan, you can cancel it within the first 30 days in order to get your money back. Should you cancel the plan after the first 30 days, it will terminate as detailed in your contract. Is there a cheaper way to get a domain / email hosting for my Duda website? Yes! Instead of signing up with Google Domains, you can also opt for a plan at Namecheap that already includes email hosting. Namecheap is 100% compatible with Duda. DudaPro is for agencies, developers, and resellers who want to offer their clients fully customized websites as a product. It gives them full control over a website project. Each website created with a DudaPro account will receive a rebate. 08 Mar 2019 – New rating. 29 Jan 2019 – Smaller updates. 20 Aug 2018 – Duda has updated their pricing. 10 products are included in any plan. 09 Jan 2017 – Duda updated its editor. It’s faster and has a new interface now. 05 Jan 2017 – Name change: DudaOne is now called Duda Responsive Website Builder. 11 Nov 2016 – Review added.